Office Cleaning and deep cleaning are services provided by cleaning contractors Acme Cleaning Services. We work with a range of businesses across Birmingham and the West Midlands, providing daily cleaning for offices and deep cleaning on an ad-hoc basis. Our Office Cleaning services are tailored to meet the needs of your company, so we are sure we can provide a service that will suit your requirements and your budget. Our cleaners are highly trained, so we are sure you will be very pleased with the results when you come to us. 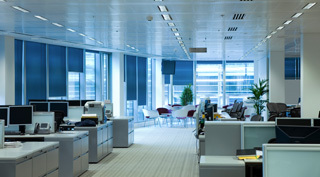 Office Cleaning contracts can be provided by the team at Acme Cleaning services. As well as commercial cleaning, Acme can provide waste management, washroom hygiene, window cleaning and other specialist cleaning services. If you would like to find out more about our professional cleaning services, please give us a call on 0121 236 8667 and one of the team will be happy to assist you. You can also email us at info@acmecleaningservices.co.uk and one of the team will respond to your enquiry as soon as possible. Acme Cleaning Services was established over 80 years ago and has a great reputation within the West Midlands and beyond.